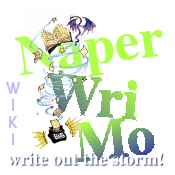 Welcome to the 2019 NaperWriMo Library Crawl, part of the local events supporting the USA::Illinois::Naperville region of National Novel Writing Month (NaNoWriMo). Be sure to consider attending some or all of our four planned workshops in October (as always, all of our events are free!). Writing a novel can be a daunting experience--it is a complex, huge task. But if you ease into it, you will find that it can be a manageable, rich experience that you can savor. 1 How do I prepare for NaNoWriMo? 2 What is the Library Crawl? 3 When are the write-ins? Who is hosting? 4 What are the write-in logistics? 5 What do I do with all of the library cards? 6 What do NaNo participants do? 7 How do I enter the prize drawing? 8 What are the prizes and how many prizes can I win? 9 Do I have to be present to win? 10 Which libraries are participating? There are four preparatory workshops in October this year. See the calendar for details. If you've missed the preparatory workshops, see the notes and slides from all our past workshops. What is the Library Crawl? The brainchild of Sarah Kovac (librarian at Carol Stream and sarahk06 on NaNoWriMo), the Library Crawl is intended to add a bit of fun to NaNoWriMo and encourage participants to visit each of the participating libraries in November, attending their write-in events. This year, NaNoWriMo's theme is "NaNoWriMo is..." and all our libraries have dived into the theme. Each library will be passing out their own meme version of the theme, created by the region's MLs. Try to collect as many as you can! When are the write-ins? Who is hosting? During the month of November, there is a write-in almost every day of the month thanks to our super libraries. In many cases, there are more than one. Check out our full calendar of events. Some write-ins are actively hosted by the MLs, other Wrimos, or library staff. There may be word wars, huzzah balls and other games (box of doom, for instance) and maybe even some small prizes to encourage a lot of writing. Write-ins without hosts can be good for folks who want a space to write and possibly power for their laptop. Most of our write-ins are at libraries (who generously provide a private space and often snacks), but other locations have included bars, restaurants, coffee shops, local colleges, trains, and town halls. You can also find online write-ins every day in our online chatroom. What are the write-in logistics? See the events page or view or download this two page brochure (PDF). We highly recommend for you to go to as many write-ins as you can. The more write-ins you to go, the more likely you are to reach that 50K word goal. And for each library crawl write-in you go to, you collect a themed library card. Trust us, you want those cards. What do I do with all of the library cards? Keep them for prize raffle tickets at the Thank Goodness It's Over Party. Many writers keep them with their laptops or novel notebooks, other keep cards with their NaNoWriMo hipster PDA. In 2018, we will be distributing the hipster PDAs at the preparatory workshops in October. What do NaNo participants do? Just attend the scheduled write-ins and be sure to pick up the write-in specific collectible cover from the write-in host. The larger your collection, the greater your chance of winning a prize at our Thank Goodness It's Over Party (TGIO). Note: you should put your NaNo username (and optionally your novel title) on each card you receive. Bring your library crawl comics to the TGIO party on Saturday, December 8th at the Naperville Municipal Center. Each card will earn you a ticket into the prize drawing. What are the prizes and how many prizes can I win? Each super NaNoWriMo participant is eligible for two prizes. The first one of the smaller prizes donated by members of the region or local businesses. Past prizes have included NaNoWriMo gear & posters, books, coffee, notebooks, and mugs. The second is a grand prize offered by the libraries - a $100 dollar Amazon gift card. Yes, to win a prize you must attend the TGIO party. However, if you can't make it you are still welcome collect comic covers at the write-ins and join us in our heroic quest for a finished novel! This page was last modified on 27 January 2019, at 15:25.